With 50 countries full of history Europe has a lot to offer. This 10 days/nights Europe Trip itinerary covers some of the most beautiful areas of central Europe: Germany, Austria and Czech Republic. It’s an ultimate Euro road trip over magnificent Bavaria, charming Salzburg and elegant Karlovy Vary. 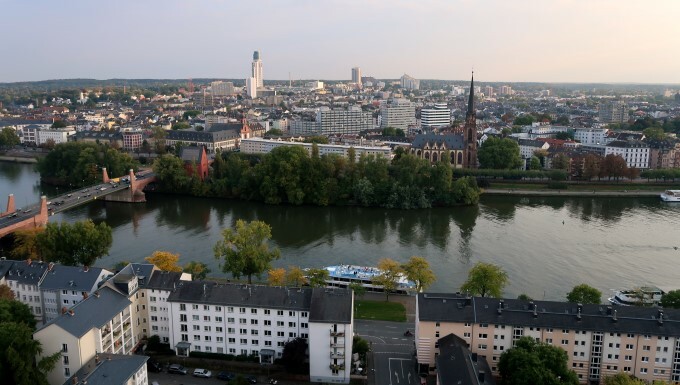 Frankfurt is an international hub with one of the world’s busiest airports and the perfect start for your Europe Trip. This largest financial center in Europe spreads over area of almost 250 sq. km. (96 sq mi) and has a lot of cultural attractions to keep you busy. The home of the Frankfurter is a modern city with some interesting architecture. Römer has been the city hall for over 600 years. 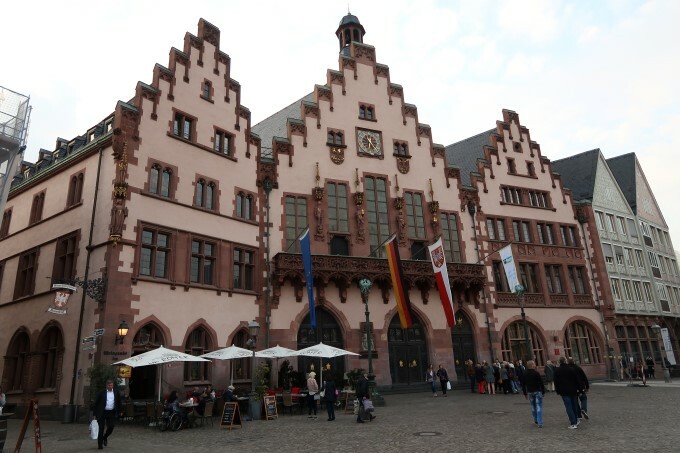 This medieval building is located in Römerberg (a plaza) in the Altstadt (Old Town) in the heart of Frankfurt. It’s a big part of German history and the plaza is a charming place to have coffee or have lunch. The famous three-peaked gothic exterior describes the history of the city and four German roman emperors (kaisers) stand above the balcony. From the end of November to end of December the plaza hosts festive Christmas market with a huge Christmas tree and a festive atmosphere. This roman catholic church with it’s prominent Gothic architecture was originally built in 7th century. Unfortunately, the interior of St, Bartholomew’s was burned out by Allied bombardment during WWII and fully restored only in 1990s. For a little fee you can go up the tower to enjoy panoramic city views. This large botanical garden in the center of Frankfurt was opened in 1871 and was mostly destroyed during WWII. It was reconstructed 1992 and now is a serene place to visit for a relaxing walk. There are multiple glass greenhouses with plants from around the world. Allow at least 2 hours to enjoy the gardens, 3 to cover it fully. This amazing natural history museum is particularly popular with children who love excellent dinosaur displays. 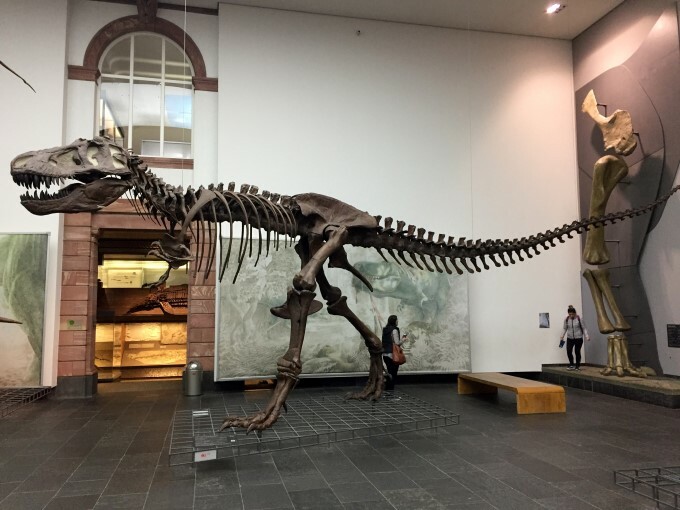 It has the largest collection of large dinosaurs in Europe with some unique fossils, like the one with preserved scaled skin. The mollusk and marine animals collection is also very interesting.The second floor has a huge collection of bird skins, which are well preserved and wonderfully displayed. Allow at least 1.5 hour to enjoy the museum, 2.5 to cover it fully. If like art, this art museum has spectacular collection of masterpieces from seven centuries beginning the early 14th to the modern pieces. Allow at least 1 hour, 2 to cover it fully. Apart being a home of Frankfurter, Frankfurt is not particularly famous for its food. However, there are gems there, which even the pickiest foodie would enjoy. This is an expensive European fusion restaurant located in Altstadt (the old town). The service is consistently impeccable and food presentation is beautiful. Try the 5 course tasting menu, if you are hungry, you won’t be disappointed! This conveniently located cozy cafe is great for a relaxing lunch. The menu is quite simple, but chicken schnitzel is great and cakes are delicious. Frankfurt is a busy city, so try to book your accommodation as early as possible. For a budget traveler we can recommend Premier Inn Frankfurt Messe or NH Frankfurt Messe, both are located out of the center, but provide great value with excellent facilities. If you would like some luxury Villa Kennedy and Jumeirah Frankfurt would provide 5 star amenities and service. The next stop in our Europe Trip is Munich! It’s a long, but rewarding drive to Munich from Frankfurt. World famous German Autobahn (highway system) doesn’t have speed limits and still absolutely free. However, you would want to take a detour from Autobahn system once you get to Würzburg. The phrase “the journey is more important than the destination” is very true for this drive. Try to leave early, so you have enough time to enjoy this road trip. 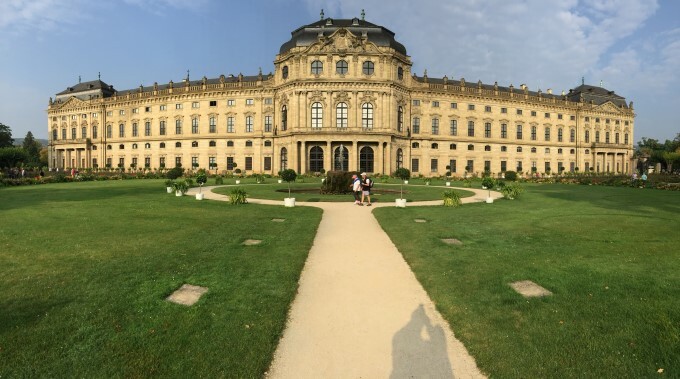 Würzburg Residence is one of UNESCO world heritage sites and a great stop over on your way to Munich. This huge palace is a great example of Baroque architecture with interior done in Rococo style. The gardens around the palace are also beautiful and provide a panoramic view to this palace. This is a start of a famous Romantic Road (Romantische Straße), which covers state of Bavaria. Allow at least 1 hour to enjoy this palace. 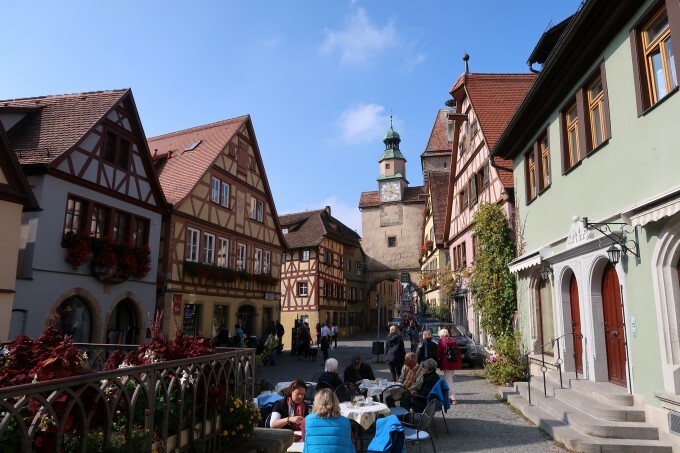 Rothenburg ob der Tauber is one of 1000 Wonders of the World and a charming place to have a lunch in the middle of your journey. This is one the best preserved medieval towns in Europe and its cobblestone streets are full of history. It was established as an imperial city in 1274 and full of original Gothic and Renaissance architecture. It was featured in few fantasy movies, one of them is Harry Potter and the Deathly Hallows and a gem of a beautiful state of Bavaria. Have a traditional German lunch in Zur Holl – Mittelalterliche Trinkstube restaurant to set you in the magical mood for the day. Allow at least 2 hours to enjoy this palace. From Rothenburg ob der Tauber continue to Munich by Romantic Road, one of 1000 Wonders of the World, which would take your through beautiful scenery and traditional German culture. This 350km route passes through most beautiful places of Germany. Munichen, meaning “by the monks” is a capital of Bavaria and apart of its famous annual festival of beer – Okoberfest has several other wonders of the world. If you would like to come during Oktoberfest, you would need to come last weeks of September or first week of October. Accommodation prices during this period are extremely expensive and if you are on budget you might want to book a place in one of the suburbs outside of Munich. 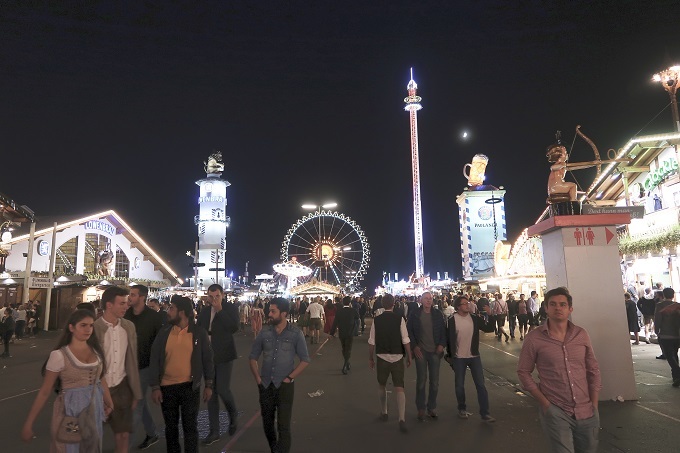 You will be likely arriving to the city in the evening of your Day 3 and there are a lot of places to visit in 2 remaining days, especially if you are visiting during Oktoberfest. 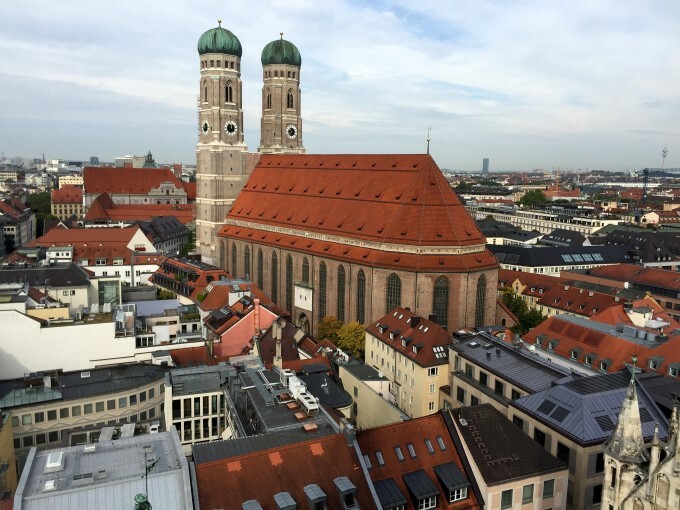 If you can spend an extra day or two in Munich, you wouldn’t need to rush to visit them all. 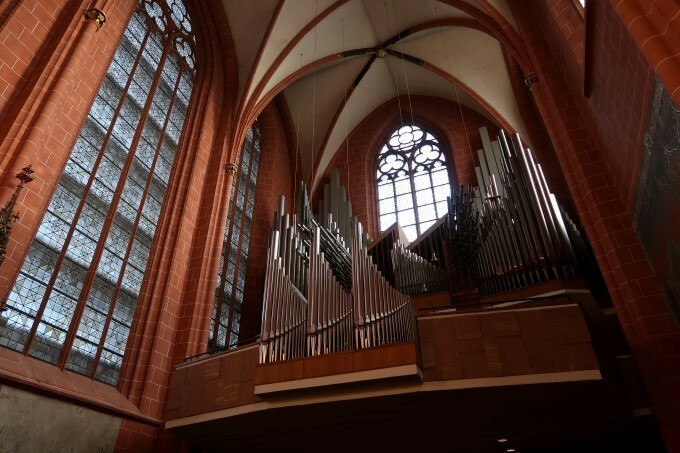 Also known as Munich Cathedral this great cathedral is a symbol of Munich and one of 1000 Wonders of the World. Unfortunately, most of interior of the church was destroyed during WWII, however one interesting attraction survived. At the entrance you can see the Teufelstritt, or Devil’s Footstep. This black mark resembling a footprint, which according to legend was where the devil stood when he curiously regarded and ridiculed the ‘windowless’ church that Halsbach had built. Hofbräu München is probably the most famous brewery in the world and also one of 1000 Wonders of the World. It was first opened in 1589 and produces 332,841 hectolitres of beer annually with franchisees around the world. 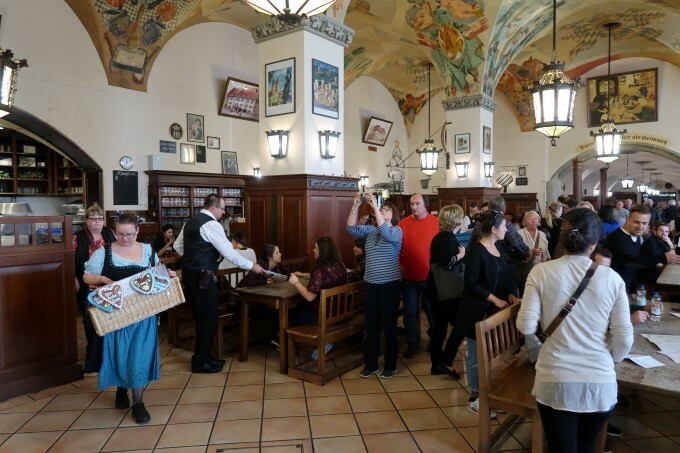 Stay inside to enjoy some traditional Bavarian music and festive atmosphere or go to the courtyard if you would like to enjoy your beer in with some privacy. Allow at least 1 hour, if you want to enjoy your beer. If you are lucky enough to visit Munich last weeks of September or first week of October, you would have an opportunity to experience world largest festival of beer – Oktoberfest. One of 1000 Wonders of the World, this festival attracts tourists from all over the world and brings festive atmosphere to this already busy city. It’s been part of Bavarian culture for over 200 years and you would see plenty of men (both German and tourists) dressed in traditional leather shorts and ladies in dirndl skirts, traditional skirts, which get much sexier for this event. The main event is running at the fairgrounds area (Theresienwiese), if you would like to participate the weekday would not be as busy and if you make it around 4-5pm, you should be able to find a spot in one of the tents, enjoy traditional music and have a beer with a sausage, chicken or a giant pretzel. Allow at least 2 hours to experience this event. 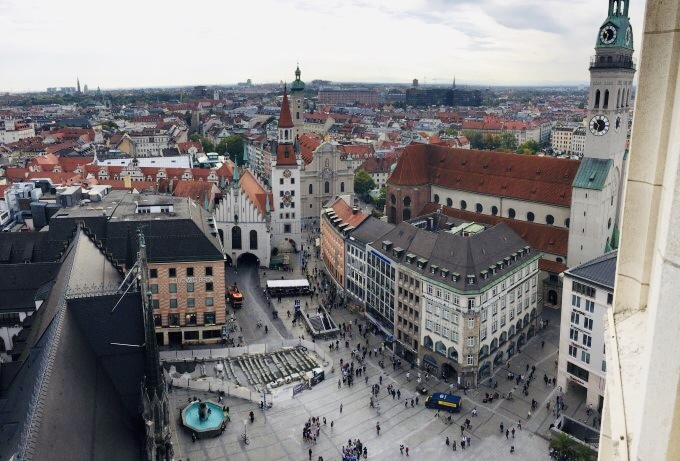 Every day at 11 a.m. and 5 p.m central square – Marienplatz in the heart of Munich is getting full with tourists waiting for a show. For around 15 minutes the new town hall building comes to live with a show below impressive clock. You see figurines re-enactment of 16th-century events with the first performance of a knight tournament set at the wedding of Duke Wilhelm V in 1568 and the second is Schäfflertanz (Copper’s Dance) represents the passing of the plaque that struck Munich around 1517. 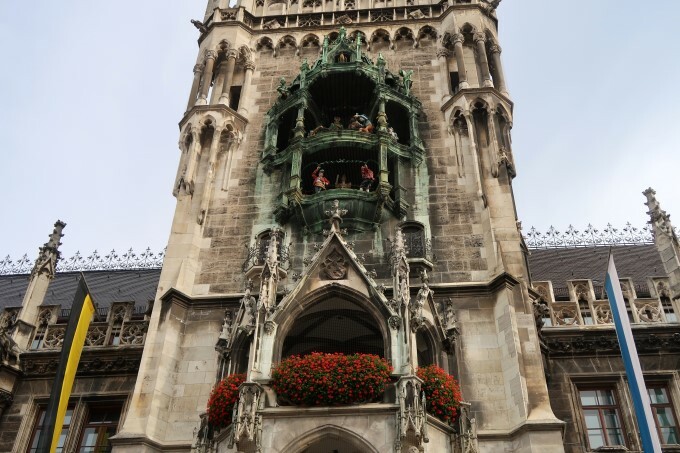 At the end of the spectacle, a small golden rooster at the top of the Glockenspiel chirps 3 times, which end the show. An impressive Munich Residenz in the center of Munich is the largest city palace in Germany. With the first building built in 1385, this palace is full of beautiful examples of Baroque, Renaissance and Neo-classical architecture. The main attractions are 16th-century Hall of Antiquities (Antiquarium), which is the largest Renaissance hall in Germany, 18th-century Baroque Ancestral Gallery and 19th-century neo-classical Charlotte Rooms. There are also impressive treasury with artifacts collected for over 1000 years and one of the world leading coin collection. Kunstareal is the whole quarter with multiple museums and art galleries representing cultural history of more than 5,000 years, which earned it the place in the list of 300 Wonders of the World. You would need more than a day to visit all the museums, so it would be better to choose the once you are more interested in. Alte Pinakothek’s has a huge collections of European done between the 14th and 18th centuries. The gallery houses one of the world’s most comprehensive Rubens collections. It has Leonardo da Vinci’s “The Madonna of the Carnation” painting, the only painting by the master in a German gallery. The Neue Pinakothek is famous for its large collection of art from Impressionist painters such as Paul Gauguin and Vincent van Gogh. The Pinakothek der Moderne specializes on Modern and Contemporary Arts. Staatliche Graphische Sammlung München has a world famous collection of 400,000 prints, engravings and drawings dating back to the Renaissance. Lenbachhaus houses work from the Blaue Reiter group of artists who worked before WWI. Museum Brandhorst displays modern work of Andy Warhol and Cy Twombly. Glyptothek has an interesting collection of Greek and Roman art. The Museum für Abgüsse klassischer Bildwerke houses famous ancient Greek and Roman sculptures as plaster casts. Egyptian Museum displays exhibits from all periods of Ancient Egypt’s history, as well as a lion from the Ishtar Gate of Babylon and Assyrians reliefs. Allow at least 3-4 hours to enjoy this district. If you still have energy and time to explore this rich city, head to Nymphenburg Palace (Castle of the Nymph). This great 17th-century summer palace is an excellent example of Baroque architecture surrounded by a beautiful 200-hectare park. With beautiful Rococo interiors and impressive park, prepare to spend hours exploring this place. 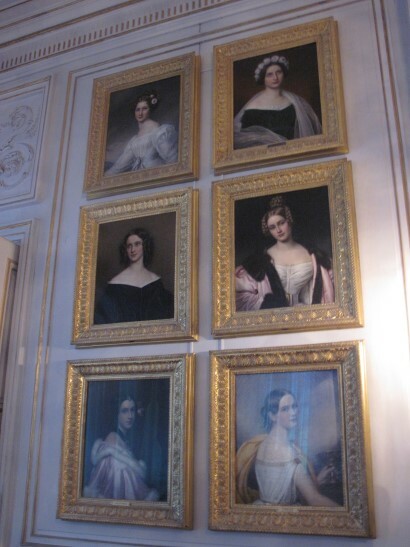 An interesting Gallery of Beauties has a collection of 36 portraits of the most beautiful women from the nobility and middle classes of Munich. Note that the palace closes quite early 4pm winter time and 6pm otherwise, so you need to plan your visit accordingly. Allow at least 3 hours to enjoy this palace and gardens. When it come to restaurants there are plenty to choose from in Munich. There are traditional Bavarian restaurant serving local dishes with draft beer and there are sophisticated fine dining options. If you are visiting Kunstareal, Steinheil 16 is a short walk with excellent traditional Central Europe dishes like chicken schnitzel. This place is popular with locals and provide very good value for money. Zum Durnbraeu is another restaurant where you can enjoy Bavarian cuisine in the relaxing atmosphere. It’s close to the center of Old Town and has a variety of local dishes. Pork medallions are fantastic and apple strudel is great for a dessert! This is another traditional Bavarian restaurant in Old Town. It’s a small place, but very cozy with outdoor seating. 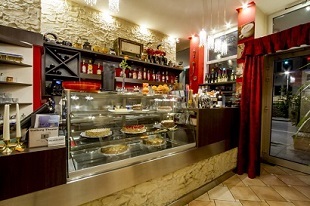 Try goulash or schweinebraten (Roast Pork) here with a cheesecake for a dessert. This is one of the best restaurants in Munich and you would likely enjoy it more than some Michelin starred restaurants in the area with double the price. Try 6 course courses set menu with wine pairings, you might have the best dinner you ever had here. There usually have some unusual local ingredients, like smoked eel from a local lake, which adds a lot to the experience. This restaurant is a bit of of the way, but worth a special trip. If you are travelling during Oktoberfest to Munich prepare to book well in advance (6 months+) and to pay at least double. If you are on budget you might want to consider AirBnb and some areas in Munich suburbs. The train system in Munich is excellent and you would be better off outside of Munich during this busy period. Inside of the city, Mandarin Oriental – Munich or The Charles Hotel are great for a luxury 5 star accommodations and Hotel Laimer Hof or Marc Munchen are both great value. In any case, try to book these places well in advance in this popular city. It’s time to leave beautiful Munichen and continue our Europe road trip by Romantic Road. It will be a long day to get to the final destination and it’s better to start the trip early morning 6:30-9am. There are few beautiful places to stop on the way and you don’t want to rush through them. 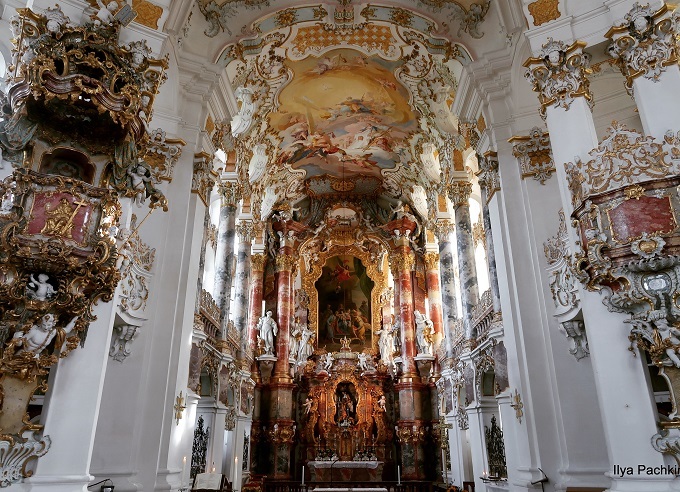 This richly decorated Rococo church is one of UNESCO world heritage sites and located in the country side in the foothills of the Alps. The story is that in 1738, tears were seen on a wooden figure of the Scourged Christ, which attracted a lot of Pilgrims. There were many who have prayed in front of the statue of Jesus on the altar and claimed to cure their diseases. It continues to be a pilgrimage site to this day with the current church constructed in 1754 with impressive rococo interior. 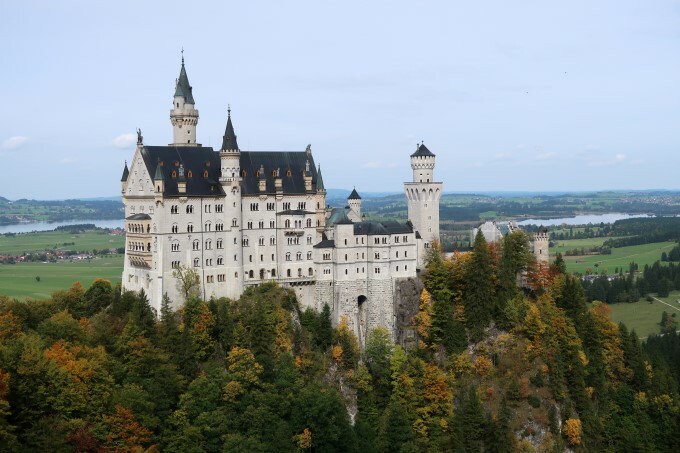 The next stop in your journey is a magical Neuschwanstein Castle (New Swan-Stone castle). This 19th-century castle built in Romanesque Revival style served as an inspiration for Disney’s Sleeping Beauty castle and for many other fantasy castles. It was named as one of 100 Wonders of the World and probably the most recognized castle in the world. The construction of the castle was funded by Ludwig II of Bavaria, who was considered to be mad by some, but by the own accord of Empress Elisabeth was just eccentric living in a world of dreams. You can’t stop yourself from feeling like you in your dream yourself being outside and inside of this fairy-tale castle. Marienbrücke (Queen Mary’s Bridge) outside of the house provides stunning views to the castle and the surroundings. This is the end of the scenic 350km Romantic Road. This picturesque Alpine town is the next stop and a beautiful stop over to have your lunch. This little town was first mentioned in 15 AD as a Roman town of Partanum on the trade route from Venice to Augsburg. There are stunning views of Alps from the streets of this idyllic town and it’s considered as one of 1000 Wonders of the World. Head to one of the traditional restaurants, such as Zum Wildschutz to enjoy Bavarian cuisine in the authentic atmosphere. Take a rest here before taking 2.5 hours drive to Salzburg. After a full day journey from Munich, you would likely be arriving to a charming Salzburg (Salt Castle) in the evening of your Day 6. This birthplace of Mazart and “Sound of music” city has both historic center and the scenic Alpine surroundings. 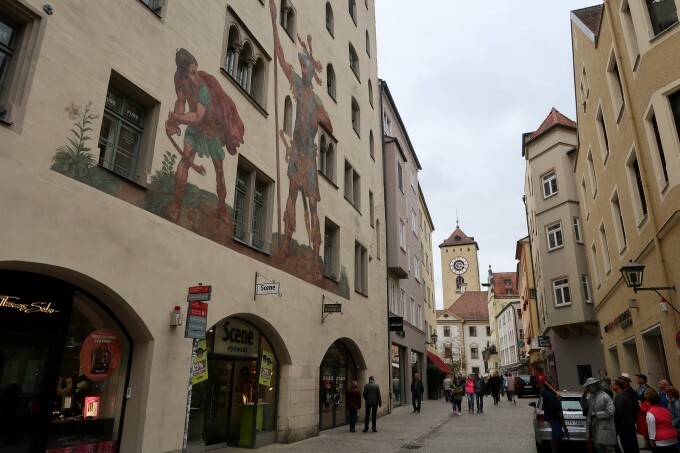 If you are not too tired head to the historical center of the city – Altstadt (Old City). We recommend you park in an impressive underground parking – CONTIPARK Tiefgarage Altstadtgarage, located inside the mountain used as a bomb shelter during WWII. It’s close to the center and you can take your ticket with you and get a stamp from a local shop or restaurant to get a discount for parking. 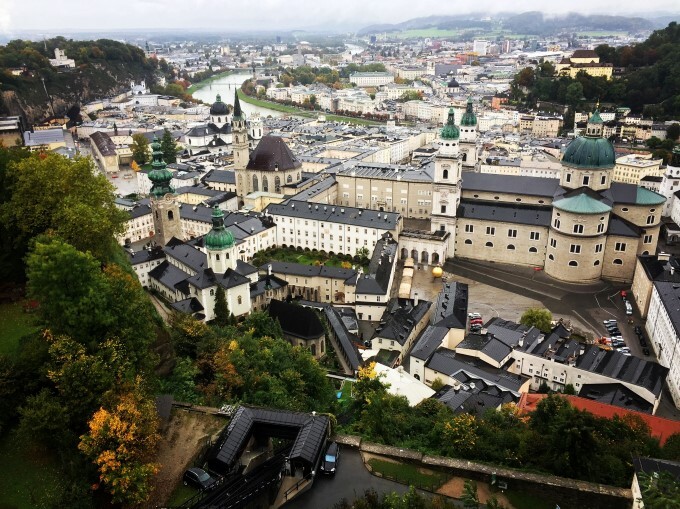 Salzburg Old Town is on UNESCO Heritage list as well as one of 1000 Wonders of the World. 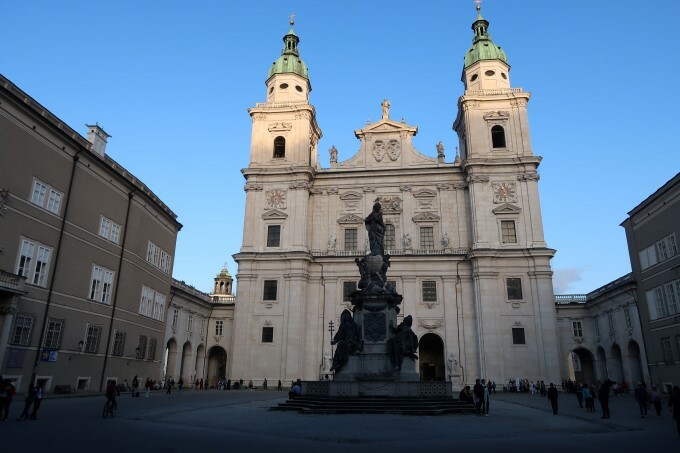 There are few beautiful plazas with Medieval and Baroque buildings, Dom of Salsburg with a history tracing back to 774, Mozart’s birthplace, ancient abbeys, such Nonnberg and St Peter’s Abbey with Petersfriedhof, cemetry dating back to 700. All of this is packed in relatively small area and ideal to explore by foot. 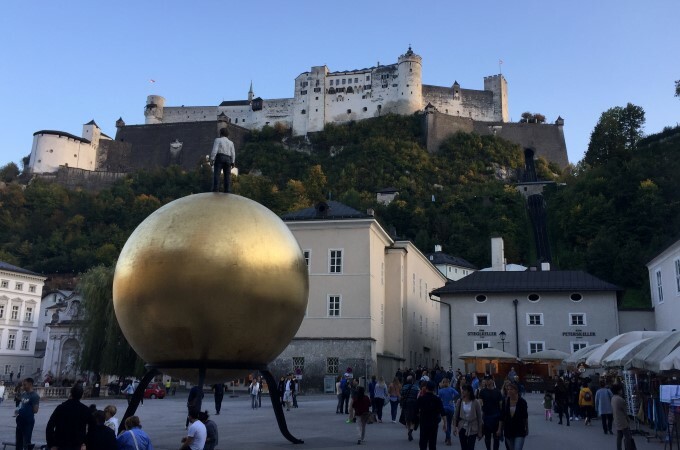 This formidable castle overlooks Salzburg and provides panoramic views over the city and surrounding Alps. This is one of the largest medieval castles in Europe, but displays areas are rather limited. You can visit it on one of the evenings or on the morning of Day 8 before you leave Salzburg. Europe is famous for beautiful Alps and you your trip to Central Europe won’t be complete without visiting these majestic mountains. Bavarian Alps are a short drive from Salzburg, which make a perfect day trip . It would be a long day if you want to visit following 3 places, so leave early 7-9am to beat the crowds and get the best experience. 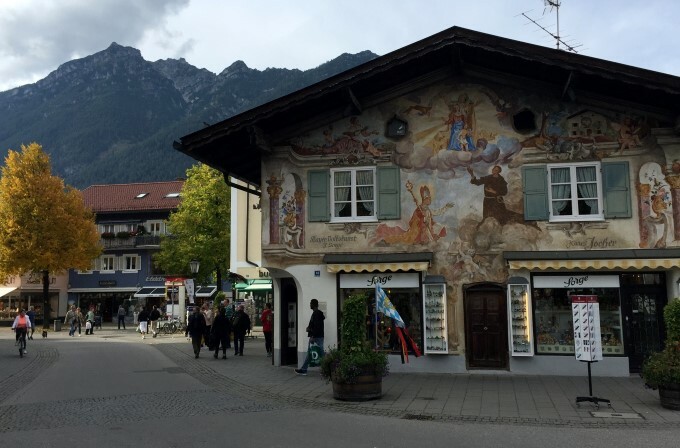 This sleepy (outside of skying season) Alpine village is actually in Bavaria, Germany, but the Berchtesgaden is only 30 minutes drive from Salzburg. This Natural Wonder of the World is famous because of nearby breathtaking emerald-green lakes Königssee (The King’s Lake) and Obersee. 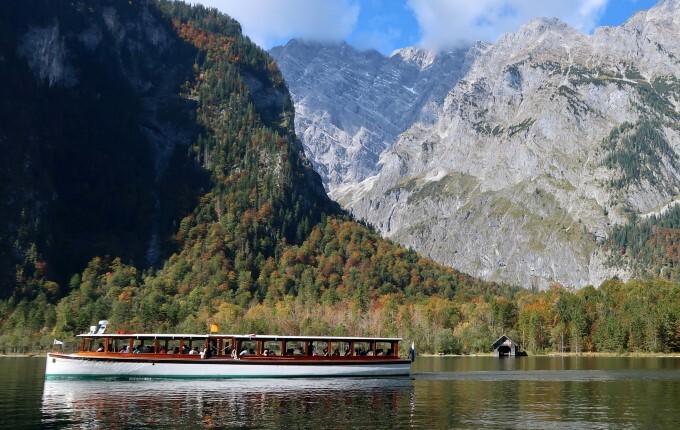 Königssee is the deepest and cleanest lake in Germany with stunning views of surrounding Alps and smaller Obersee provides even better photo opportunities. The full boat tour is highly recommended, which would take you slowly on the electric ferry through this majestic fjord. The boat ride is very relaxing and because only electric boats are used on the lake is very quiet. After some time of your journey captain would stop a boat and one of the crew would play on the flugelhorn (trumpet). This is the place called Echo Chamber, where you would hear amazing echos from the sound of music reflecting of surrounding mountains. You would have an option to come off at St. Bartholomä church stop, but we suggest you continue all the way to the end – Salet Boat Dock. From Salet Boat Dock you would have gorgeous views across the lake and can take 10 minutes walk to beautiful Obersee lake. The water in this lake is unbelievably still and clear, so you will have a surreal feeling like you are in the dream. 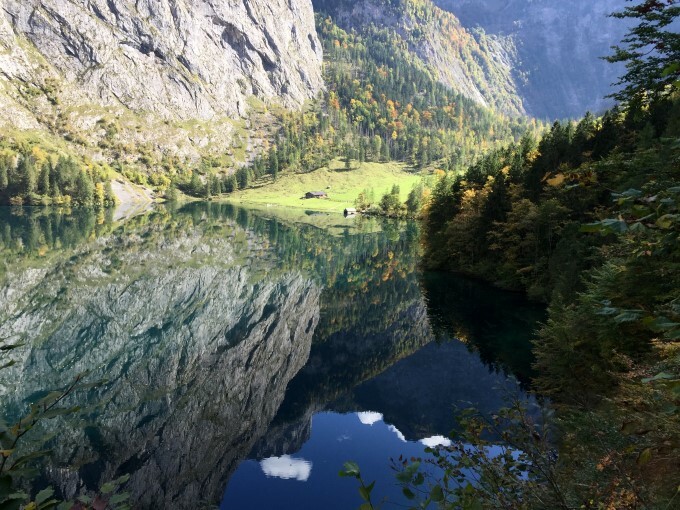 If you enjoy hiking, you can take farther 30 minutes hike to Fischunkelalm Farm walking by this amazing lake and from there more challenging hike to Röthbach Waterfall (the tallest waterfall in Germany). On the way back you have an option to visit St. Bartholomä, which has an interesting Ice Chapel Cave, but you would need extra 3 hours to visit it and won’t be able to visit other attractions on this day. Only 15 minutes drive from the parking lot of Königssee, this Nazi Party building was used by Nazi inner circle, their families and important visitors to meet and relax. You can get your lunch either in the restaurant where you catch the bus at Obersalzberg or at the top in the current Eagle’s Nest building. To get to the building, you would need to take a specially designed bus (too steep for regular vehicles), go through a tunnel and take an elevator. There are still some original Nazi artifacts inside of the house, such as red Italian marble fireplace presented by Italian dictator Benito Mussolini. 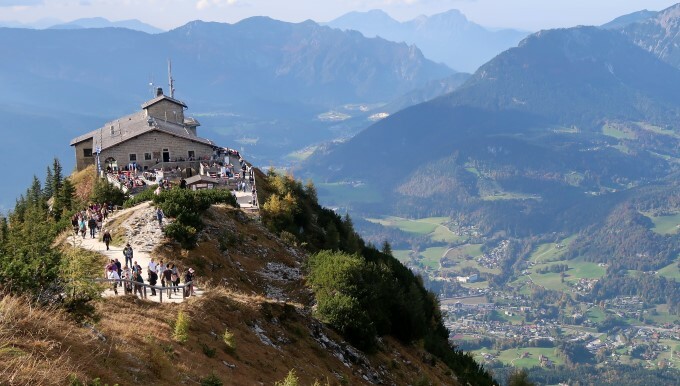 The views to the Alps, Berchtesgaden and Salzburg from the top are superb and there are several hiking trails through Bavarian Alps, originating from this area. Allow at least 1.5 hour. If you still have time and energy to visit this Natural Wonder of the World, we highly recommend it. Eisriesenwelt Caves (World of the Ice Giants) is the largest ice cave in the world located in about 1 hour drive from Eagle’s Nest. It’s not opened winter times and the last cable car up is either 3:20 or 4:20pm depending on a month, so you would need to plan your day carefully if you want to make it. 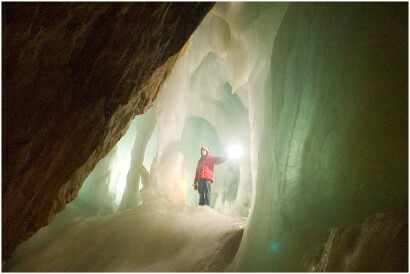 The cave has amazing ice formations. It’s constant 30F (-1C) inside, so you better bring warm clothes and since its slippery sturdy boots. There are a lot of nice restaurants in Salzburg, but if you want to experience authentic Austrian beer garden experience head to Augustiner Braustubl. This is the largest beer garden in Austria established in 1621. There are 1400 seats in the courtyard alone and you can get lost in the maze of halls inside. The place is simple, but very relaxing especially when you seat outside under chestnut trees with drinks and food very reasonably priced. It’s mostly self-service with food for sale in stalls arranged in the style of a traditional market hall. 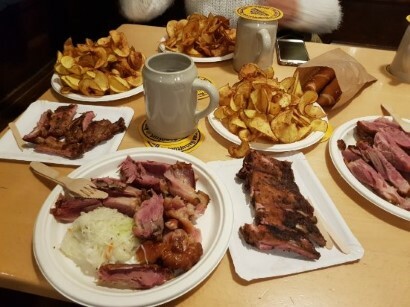 Try delicious pork ribs (Schweinsripperl) or pork knuckles (Stelze). If you can afford a luxury accommodation stay in a royal Hotel Schloss Monchstein close to the center of the city with gorgeous views to Alps. If you are on the budget stay in Hotel-Pension Bloberger Hof, which has views to the mountains as well, but is much more affordable. The great thing about Europe is that you can travel from one country to another in matter of hours. Most interesting cities are around the borders and Europe trip is full of scenic views and historical places. It takes about 5 hours to get to elegant Karlovy Vary in with a stop for lunch in medieval Bavarian town Regensburg. Regensburg is of of the best preserved medieval towns in Europe and one of UNESCO world heritage sites. Located on the beautiful Danube river this Bavarian town has plenty of original 12th-century buildings including Old Bridge. It used to be one of the centered of the Holy Roman Empire before its fall and conversion to Protestantism. 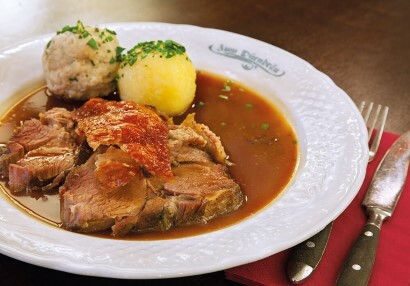 Have a lunch in cozy Weltenburger am Dom restaurant serving traditional Bavarian dishes. This spa town was first established around in 14th- century by Roman Emperor Charles IV and then named Carlsbad after the emperor. It became an important cultural city in 18th century popular with aristocrats and celebrities from all over the Europe coming here for spa therapies and to drinks its healing spring water. 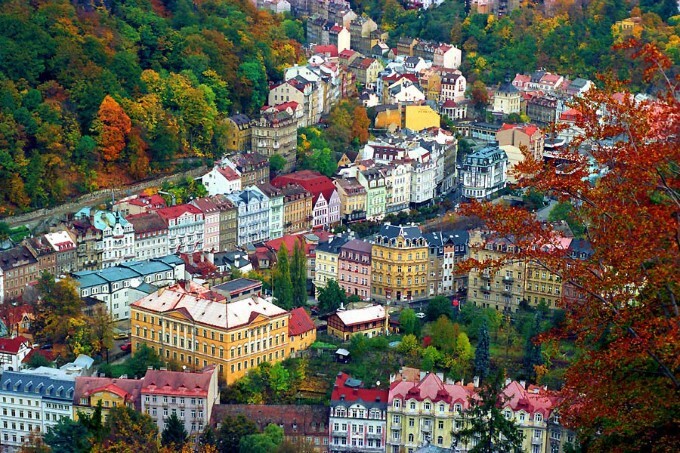 The town had majority German population, but most of the German residents were forcefully expelled after World War II with properties confiscated and town was renamed to Karlovy Vary. You get a specific Eastern European feel wandering through streets of this beautiful spa town. It lately became very popular with Russians buying properties and businesses in the town. This elegant spa town is especially beautiful in Autumn. 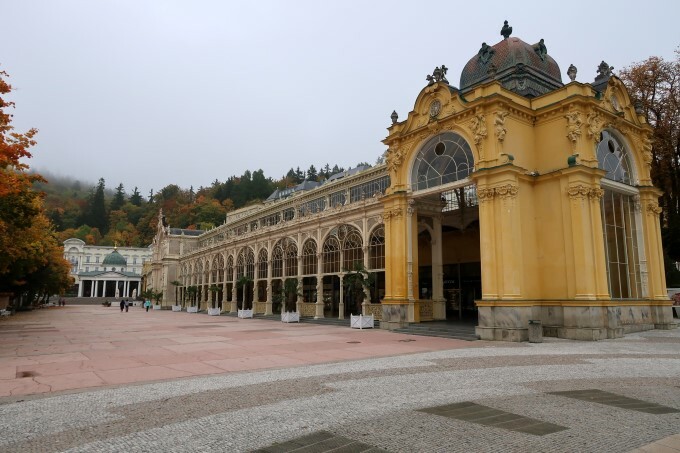 Karlovy Vary is famous for its mineral waters and there multiple Colonnades where you can try free mineral or thermal water from different springs. There is even a geyser, which spouts water up to 12 meters high. One of favorite activities of tourist and residents is to walk through the town enjoying the healing waters on the way. 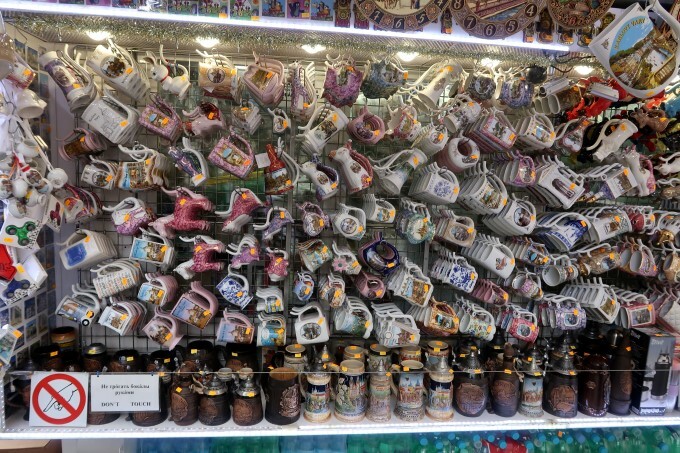 There are special spa cups made from porcelain in all kinds of shapes sold throughout the town. Buy one of them to join tradition, fill it with water from one of the spring fountains and sip it on your way. These beautifully designed spa cups make a perfect souvenir to remember this amazing town. Mariánské Lázně or Marienbad is one of 1000 Wonders of the World and just a short drive from Karlovy Vary. This picturesque town is surrounded by green mountains and hundred mineral springs. It has a large park in the middle, singing fountain, multiple colonnades and famous for the healing power of its hot springs. Most of the buildings are from the 19th century when this spa town was popular with Europe’s nobility. Watch “Last Year at Marienbad” classic to get a feeling of this town from this golden age. It was settled by Germans and majority of the population were Germans till the end of WWII when ethnical German population was expelled and it was officially renamed from Marienbad to Mariánské Lázne. After WWII, it was opened to foreign visitors only in 1989 and is now attracts tourists from all over the world. This is a hidden gem with delicious local food considered by many the best restaurant in Karlovy Vary. The atmosphere is charming and you might want to keep coming back to this restaurant for your whole stay. 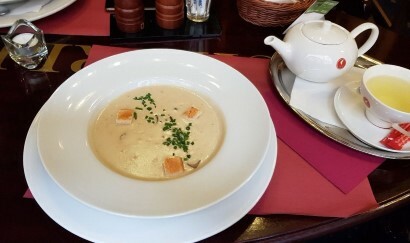 Try amazing wild mushroom soup, deer goulash or dumplings. It’s a small place, so make sure to make a reservation. This friendly place serves traditional Czech dishes in authentic atmosphere. Try delicious roasted duck and vanilla pancakes! It’s a small place and they don’t accept credit cards, so bring some cash. The best thing about Karlovy Vary that it’s cheap! 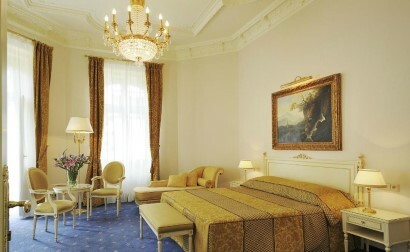 After Germany and Austria you can stay stay in the luxury hotel in Karlovy Vary for a fraction of the price. You can stay in either of these three 5 start spa hotels and feel like a royalty: Retro Riverside Luxury Wellness Resort, Hotel Romance Puskin or Savoy Westend Hotel. Our Europe Trip come to the end, but this is one more wonder to see! 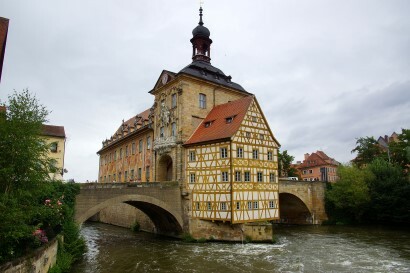 4.5 hours drive from Karlovy Vary to Frankfurt allows you to visit another medieval town of Bamberg before you end this amazing adventure. This town is one of Cultural Wonders of the World with great examples of medieval and baroque architecture. It has one of the largest preserved old town centers in Europe with spectacular cathedral square. The main square has Romanesque cathedral, the amazing New Palace in baroque and Renaissance Alte Hofhaltung Palace. Follow us on Instagram – @1000wondersoftheworld or subscribe to our Wonders of the World YouTube channel to view videos of this Europe Trip as well as other trips.